Spring holiday, like St Patrick’s Day and special family events that happen in spring, are perfect reasons to change interior paint colors or furnishings and enjoy fresh living room decorating ideas. Spring inspired, blue-green interior color schemes make living rooms decorating brighter and more beautiful, adding charm, style and comfort to modern homes. White and all shades of green color are associated with St Patricks Day celebration in March, but you can continue enjoying beautiful green colors after St Patricks Day party. Vivid or light blue color accessories can be added to green living room furnishings or paint colors, dramatically changing living rooms decor and inviting spring blue sky into the room. White and green color schemes feel positive and airy. White, blue and green interior color schemes, that include light blue or modern citrus shades of green color, make living rooms feel natural and joyful. Inspired by spring, blue sky and fresh green foliage, blue-green interior color schemes feel healthy and pleasant. How long a green paint stays in your room after St Patricks Day party depends on you. Some people prefer change living room decorating ideas and color schemes every season and every year. Others do not change furnishings and paint colors for years. The most important thing is to plan your room transformations to save time, energy and money, avoiding buying new furnishings to match green paint colors. 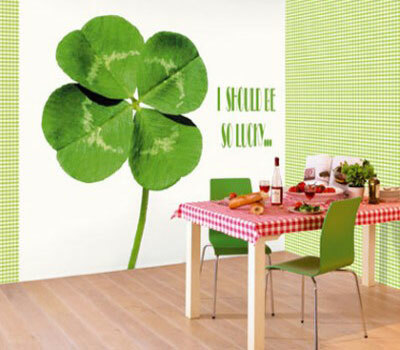 Selecting white-green interior color schemes, modern wall stickers, prints, wallpaper designs or green room paint colors can be a part of preparing your home for St Patricks Day. Later your can add sky-blue or gray-blue accessories, like curtains, table lamps, paintings, vases, floor rugs or cushions, creating beautiful spring interior. Get inspired by the cup of coffee and chocolate shamrock decoration, add bold blue and comfortable brown to traditional white and green living room decorating ideas for St Patrick’s Day. Seasonal change of home interior colors is natural. Bright, energetic and happy colors prepare home interiors to welcome spring.